Join us as we raise money and awareness for gabe! It is the mission of the Section 16H Group to bring people together in an effort to change lives and raise awareness in a positive and uplifting environment. We gravitate to causes that are impacting the life of someone close to us and this cause is for someone very close to us in the “201”. All proceeds for the upcoming events will be donated to Evan and Bari Patnoi and their fight against childhood cancer which includes the burden of expenses they will incur over the next year. #neverGABEup! The fight against childhood cancer begins with passionate people that are ready to FOCUS. The #neverGABEup movement welcomes everyone who wants to join Evan & Bari Patnoi’s team as they commit everything they have to fight this disease for their son. This past November their family was delivered the news that their 12-year-old son Gabe was diagnosed with Bone Cancer. From the first moment they received his diagnosis, they FOCUSED and hit the ground running and so did the community! We invite you to join them in this fight. Are you ready to FOCUS and join the fight? The #neverGABEup movement welcomes everyone to join Evan & Bari Patnoi’s efforts to provide resources and funding necessary to beat this thing. The success of this fight begins and ends with our “201” community. 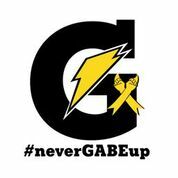 Your commitment to getting involved and supporting the #neverGABEup movement is instrumental in winning this battle. *Please note there is a $100 cover charge for this event. There will be many more events catered towards Gabe so we encourage everyone to come out and help a great cause. We hope to see you soon for drinks, food and football. On Saturday December 15th at 4pm, Adam Platin is organizing a fundraiser to raise money for the Patnoi family. Join us for an hour of burn, sweat, and fun. To support Gabe and his family please access the button to fill out the form for the class. Please note: a minimum donation of $50 is required. Click here to donate. *Please note: You must donate $50 first and then sign up for the Orangetheory class.